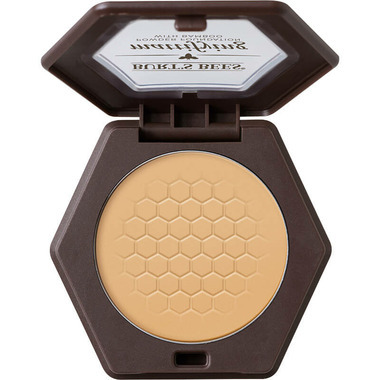 Burt's Bees' 100% natural, non-comedogenic, oil-control Mattifying Powder Foundation gives you a smooth and even skin tone. Lightweight and made with Bamboo to blur imperfections, it provides buildable coverage that blends effortlessly. Such a High Quality product. Love the packaging. The powder is great. It's more of a finishing powder to me. The coverage is very light unless you beat your face real good maybe medium. The shades run very lighter than pictured on screen. I'm usually MAC NC30/35 and got the Bamboo which was a bit light on my skin. I like this as a nice light powder. It does absorb oil. My face isn't oily itself but I find that when I use facial oil it causes my eye makeup to "melt". I was hoping this would help with that. I think it does help but doesn't eliminate the problem. It definitely makes my face more matte, and it lasts well. I'll likely purchase again. This powder is light and feels clean on my skin. I don't like feeling like I'm wearing make up and this powder is great that way. I like the ingredients as well. I would buy it again. Maybe in a shade darker. This foundation is definitely matte and can look cakey on dry patches. It's light to medium (medium being a stretch) coverage and doesn't wear very long, reapplication is required. On days where I just want to even out the redness or add a little extra coverage over my liquid foundation, this is great. I picked up Vanilla for my light skin and it is a tad light but nothing bronzer can't fix. Colour chart very accurate. Goes on great and amazing price!